We have many things to be thankful for, and Thanksgiving helps us remember to count our blessings. While Bastrop State Park and Buescher State Park have both suffered some tremendous losses over the past few years, there is still a lot to be thankful for. 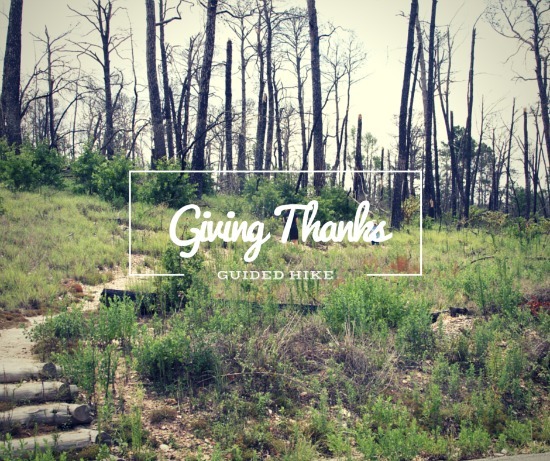 In honor of Thanksgiving, Bastrop State Park is offering a Giving Thanks Guided Hike to reflect on how this landscape brings us hope for the future. Join a park ranger on Nov. 26th or Nov. 27th from 10:00-11:30am for an easy hike through the forest. Free after park entry fees. Click here for more info. Join a Master Naturalist for a mile long hike on our trails at Bastrop State Park. Join us for a easy walking tour to explore the amazing hand crafted buildings and structures that the Civilian Conservation Corps men built in the depths of the Great Depression. Connect with generations past and meet a Ranger for a demonstration about how to make a campfire! Reach back to a time where people gathered around a campfire for warmth, survival, communication, and entertainment. Join us around the fire for an hour of Ranger-led campfire stories. And click here to find out more about the Top 5 Hiking Trails in Bastrop County.